From left, White Violet Center for Eco-Justice interns Elaine, Alexis and Rebecca. Recently I had an opportunity to welcome the newest interns at White Violet Center of Eco-Justice – Elaine, Rebecca, and Alexis. I was taken aback by their many questions about religious life. “Why did you decide to be a sister?” one asked. I’m asked this question often. I answered with my standard vocation story: I had everything I thought I wanted in life, but I felt like something was still missing. All true; however, later that evening as I reflected about my answer, I realized the answer I shared no longer fit. It was not the response that I wanted to share with them. The next day during my morning prayer, I was using a reading from my favorite author, Sister Joan Chittister OSB. It was during this reading that I realized how much my theology, faith and desires have evolved these past five years. Sister Joan Chittister speaks of a “spiritual life” that the world teaches us to ignore, bury and smother if we are to be successful, productive citizens. This “substandard ideology,” as she calls it, is what woke me up to the idea that there had to be something more to life than acquiring all the material possessions I could afford. Sister Joan invites us to pursue a “spiritual life” which calls us to a deeper, truer, and more authentic way of living in a world that expects just the opposite. I can honestly say that I have witnessed, felt and experienced this “spiritual life” being lived out among the Sisters of Providence. If you have spent any time at Saint Mary of-the-Woods among the Sisters of Providence, I am certain you know exactly what I am talking about. I am blessed to live with women who walk this journey with me, soul companions as I like to call them. They have dealt with the same kind of soul-searching questions, hopes, dreams and desires that I have about life. 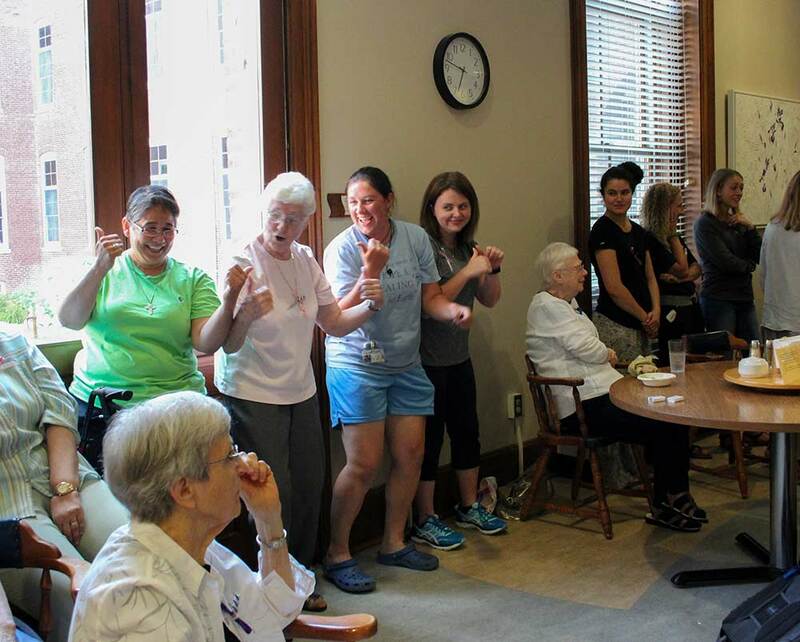 Sisters Joni Luna and Joseph Fillenwarth, left, dance with friends at a social this summer at Saint Mary-of-the-Woods. I became a sister because the life I had built for myself no longer served me. Becoming a sister means I am choosing to live counter to what the world deems acceptable. It means I am saying “no” to marriage and having my own children. However, I am saying “yes” to being available to serve and to opening my heart to reflect love and kindness in the world. It means I say “no” to material possessions, so others may have their just share of resources. It also means I make a conscious effort to be Christ-like in a world which is in critical danger of the believing that it is every person for themselves. Being a sister invites me daily through prayer to expand my thinking and to be open to service for a mission greater than myself. It means becoming the person God created me to be instead of being lost to worldly principles and beliefs. More importantly, it means having the support, love, care and concern for living out my “spiritual life” with like-minded women who are in pursuit of living out their “spiritual life” through daily authentic soul-searching prayer and communion with one another. Being a sister invites me daily to look at the core of my soul, admit my character defects, however uncomfortable that may be, and know fully that these defects do not make me weak or bad but simply human. Choosing this life has taught me to embrace who I am and who I am becoming. Being a sister doesn’t ensure my going to heaven or living a hurt-free or pain-free life. It does not give me prestige or pay a six-figure salary. On the contrary, I have no earthly idea where the pursuit will take me, but I am learning to trust in Providence. The Providence, which, our foundress Saint Mother Theodore reminds us, “has never failed us.” When I look at the person in the mirror, I like who I am becoming. Sister Joni Luna is a native of San Antonio, Texas. She entered the Sisters of Providence in 2012 after spending many years as a physical education teacher and athletic director. Sister Joni professed first vows in June 2016. She currently ministers as athletic director and physical education/religion teacher at Saint Patrick School in Terre Haute, Indiana. Beautifully stated, Sister Joni. I’m so glad you followed your heart. Love you. You have expressed it very well as to why we need to go out and make a difference in our world. Your reflection has touched me in a very special way. You are a special young woman; but then again I have known that for a long time. Thank you for sharing and being a part of the Sisters of Providence. Joni, I loved what you shared. Thanks for all the reminders of how Providence works in our lives..
JonI, I used your article for my morning meditation. Thank you for your inspired words. And yeah to Joan Chittister too!